As the clock strikes 6 am, a municipal tractor in Hile, Dhankuta winds its way across town, collecting waste destined for a landfill 13 kilometres downhill. While most Nepali towns still struggle with solid waste problems, Dhankuta’s management functions seamlessly like clockwork. Not only is the town visibly cleaner, its municipality is now generating significant income from keeping it so. 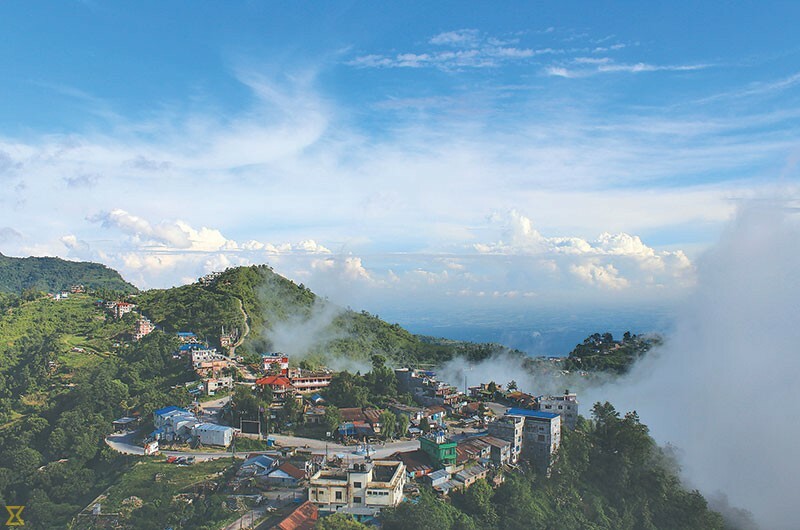 Just this week Dhankuta was declared the ‘cleanest city’ in the country, bagging the top spot in an annual contest sponsored by the Government of Nepal’s Solid Waste Management Technical Support Center (SWMTC). The award, established in 2013 by the Ministry of Urban Development, has seen three winners till date–Pokhara, Hetauda and Syangja. Dhankuta was placed second in last year’s contest, which carries a total cash purse of Rs 10,00,000. When problems became untenable, he says, Dhankuta locals got together to discuss solutions. That was in the year 2009. In the years since, they established a landfill in Salleri, at the foothills of a jungle--spread over an area of 30 ropanis at a cost of Rs 40 million—to handle 10 tons of waste every day for the next 25 years. Then they declared Dhankuta ‘plastic-free’, and not just as a gimmick. Today the municipality is visibly spick-and-span. Garbage cans dot the streets and are emptied regularly. The municipality employs 16 sanitation workers, who visit different routes each day to ensure all wards under the municipality are covered. They sweep up the public places and street corners every day, while the streets in front of houses and shops are swept clean by the owners themselves. According to a report published by the World Bank in 2015, nearly 7,000,000 tons of waste is generated annually in Nepal’s cities. Out of this, less than 50 percent is collected, while most of the waste is haphazardly dumped. Although solid waste management can make up to 50 percent of a municipality’s annual budget, many municipalities do not earn any revenue while providing waste management services. Dhankuta is, then, an exception to the norm. The Dhankuta landfill site occupies the centre of a unique model where three tractors tow in waste from its 10 wards every morning. While landfills elsewhere battle stench and filth, at the Dhankuta landfill, the municipality has actually designed and built a garden on top of the buried waste. The bouncy garden, carpeted in green and spotted with pretty seasonal flowers, is the pride of the entire town, drawing locals, especially children, in droves. Over 100 groups of outsiders have also visited the ‘garden’ to learn how the model might be copied. Locals now also recycle and reuse materials they would earlier have thrown away as garbage. The municipality has trained households to segregate biodegradable and non-biodegradable waste and most households repurpose biodegradables as manure or cattle feed. This has drastically cut down on the waste produced. As a result, the landfill load has also eased. As the first load arrives, sanitation workers sort through paper, plastic and metal. Then another group reclaims the waste for reuse. The municipality has auctioned off the reusables to Kaushal Thapa, a local entrepreneur, for an annual royalty of Rs 50,000. While this may seem nominal, the enterprise provides regular jobs to nine people, while also producing raw materials for businesses. Before working with the municipality, Thapa used to run a scavenging business, with his staff visiting houses to collect waste materials. But once the landfill was established, he realised that this could be a valuable source for his business. “I talked to the municipal authorities about how we could work together to reduce waste,” Thapa explains. As per their agreement, Thapa’s staff visit the landfill every day and sort reusable waste, which he sells to local businesses and those as far away as Dharan, Itahari, Biratnagar and even Jogbani in India. “If five tractors of waste were buried in the landfill site earlier, now barely two tractors are buried each day, and the rest is put to good use. I am satisfied with the profits, and happy that I am helping keep my town clean,” Thapa says. Dhankuta residents have also adopted another eco-friendly method of upcycling waste. Vermicomposting, or producing manure with the help of earthworms, is now commonplace. Yashoda Shakya, a pleasant-faced homemaker, is often kept busy with her responsibilities inside her home and out, as a member of various cleanliness and management committees. But she makes it a point to take time out to segregate the waste produced by her household, and cut up the bio-degradable waste into tiny pieces. “This makes it more palatable for the earthworms,” she explains, “We must also avoid putting in waste that is oily, hot or sour.” Shakya precisely follows every step of the process—preparing a bed for earthworms out of sawdust or cotton clothes; spreading finely layered bio-degradable waste over the bed, placing earthworms, and then securing the bin with a jute sack. Within three to six months, the bin produces rich black manure that Shakya spreads over her kitchen garden. Even the water drained from the bin is used as manure for flowers. The money is earned through earthworms, which she raises with great care. She sold 15 kilos worth last year to the municipality—at a decent rate of Rs 3,000 per kilo. “If each household, especially in city areas, managed their waste in this manner, imagine how clean our streets would be!” she says. And while the process might seem cumbersome to some, Shakya hastens to assure that it is easy. “All I need is a bin and maybe 15 minutes each day to tend to it,” she says. One of the prime forces behind the change in Dhankuta is Upendra Khanal, Head of the Environment Division at the Municipality. “Not too long ago locals felt that waste management was singularly the municipality’s duty, and that they were entitled to discard waste as they wanted. Now they realise that cleanliness benefits everyone,” he says. He then lists his challenges. “The biggest challenge is achieving behavioural change at the household level. Once people hold themselves to account for the waste they produce, then half the battle is won,” he says. Khanal points to the challenge of sustaining the waste management system, considering that it is expensive and logistically tricky. The municipality collected Rs 1.4 million in user fees for solid waste management from households over the last nine months. Till last year, a big chunk of municipal expenses was borne by a funded-programme. The municipality now generates a portion of its own revenues, but is actively looking for other ways to ensure long-term sustainability. But as the population increases, so will the amount of waste. Dhankuta’s 10 ton of waste per day might seem meagre compared to Kathmandu’s 457 metric tons of solid waste per day (CBS data, 2013), but Khanal is aware that the number will multiply quickly, and steps need to be taken beforehand. Khanal also sees the need to build better infrastructure around the landfill, ensure extra amenities to people living nearby, procure a specially designed garbage truck, upgrade to a more advanced waste treatment facility, and provide additional training for the disposal of hazardous waste.